Pasta with Roasted Red Pepper & Goat Cheese Sauce – Bon Appetit Baby! Happy middle of March! Who cares about mid-March you say?? I do! Mid-March means the NCAA basketball tournament. I love the Madness! The brackets, the buzzer-beaters, the underdogs, the team spirit, the heart and soul… I love it all! This weekend has been a little bit of a roller-coaster for me though. I’ve enjoyed my time glued to the couch, flipping between games. But then my hometown VCU Rams fizzled out in the first round. My Virginia Cavaliers and South Carolina Gamecocks each had strong second halves to win their respective first round games. 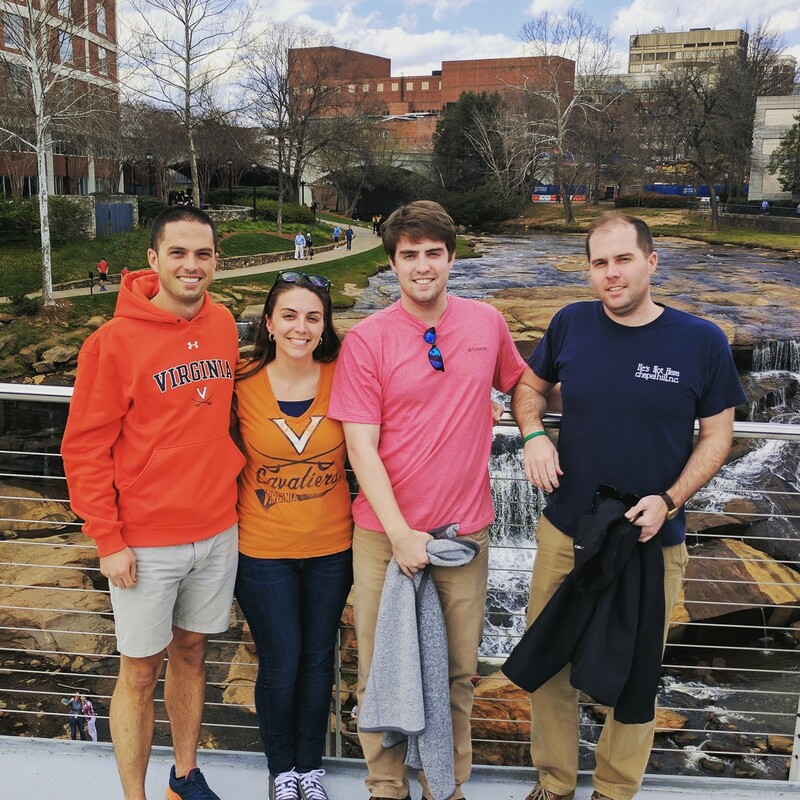 We went to Greenville, SC to hang out with my brothers and immerse ourselves in the tournament festivities downtown, which was really fun! But then… UVA lost in the second round in pretty much the most soul-crushing fashion imaginable. So that was definitely a down moment. And by down I mean, I may or may not have shed a tear or two. I pretended it didn’t happen today and watched the games all afternoon. This pasta dish may not be your most traditional game-day food, but we enjoyed it none the less. Rub 1 tsp of olive oil over the peppers and place them on a foil-lined cookie sheet. Roast peppers for 30 minutes. They will begin to blister. Allow the peppers to cool slightly. Remove the seeds and stems. Place the peppers and the milk into a food processor. Give it a few spins until you have a nice puree. Meanwhile, heat the other 1 tsp of olive oil over medium heat. Mince the garlic and brown in the olive oil for ~3-4 minutes. Turn heat down to low and add the red pepper puree, goat cheese, and all of the remaining spices to the pan. Cook over low heat for ~15 minutes, stirring occasionally, until ingredients are well-combined and heated through. As the sauce is coming together, prepare your pasta. Serve sauce overtop of pasta and enjoy! Makes 2 large servings or 4 smaller side dish servings. Posted on March 19, 2017 March 17, 2018 by bonappetitbabyPosted in DinnerTagged Cheesy, Goat cheese, March Madness, Noodles, Pasta, Red pepper, UVA.